Find out how the gift of a piglet was able to rescue a little Nepali girl from slavery. At the age of 60, Olga Murray, an attorney with the California Supreme Court, made a promise to improve the lives of Nepali children. In 1990, she founded the Nepal Youth Foundation, a nonprofit organization that has served more than 45,000 children by providing them with what is every child’s birthright: vital healthcare, education and a safe environment. Olga's Promise is the story of how she fulfilled and even surpassed her dream. Olga is living proof that it is never too late to make a difference in the world. 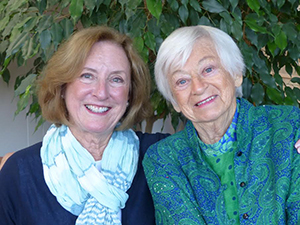 "Olga Murray, at 90, has been a tireless crusader for the freedom and dignity of thousands of young girls in Nepal consigned to indentured servitude. Her work has helped to provide them with access to education and the chance for a decent life. Olga's Promise is her personal story, which I hope will inspire others to action." The Dalai Lama recognized Olga as an "Unsung Hero of Compassion." "Olga Murray is dedicated to saving children from neglect and exploitation. She is the beloved mother of thousands of kids to whom she has given protection, opportunities, joy, and above all, love. She has boundless kindness to embrace the least fortunate and unmoving determination to fight for them. Olga is my hero." "Next time you think one person can’t make a difference, think of Olga." OLGA MURRAY was born in Transylvania in 1925 and came to the United States at the age of six with her parents and three siblings. She grew up in New York City. After graduating from Columbia University and George Washington University Law School, she worked as a research attorney at the California Supreme Court for 37 years. In l984, approaching the age of 60, she traveled to Nepal for the first time and fell in love with the country and its people. 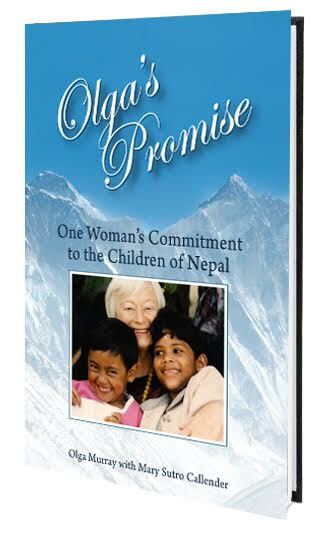 Recognizing a critical need to improve the lot of Nepali children, she founded the Nepal Youth Foundation in 1990. Over the past 25 years, the foundation has provided education, shelter, health care and other essential services to over 45,000 Nepali children. Since 2000, more than 13,000 girls have been liberated from indentured servitude and the practice of bonding them has been eradicated. Olga divides her time between Kathmandu, Nepal, and Sausalito, California. MARY SUTRO CALLENDER grew up in San Francisco and attended Stanford University. For many years, she wrote a weekly column entitled "Nature's Kitchen" for United Feature Syndicate that was published in newspapers throughout the United States. She had a career in philanthropy as the Executive Director of the Gamble and Michelson Foundations, and as a senior Program Officer for the Bothin, Kimball, MacDonnell and Roberts Foundations, all located in the San Francisco Bay Area. She has been an advisor to numerous nonprofit organizations, including KIPP Bay Area Schools, Food Runners and Wildlife Associates. Mary and her husband, Steve, live in Marin County, California, and they travel extensively, often to visit their 12 grandchildren.